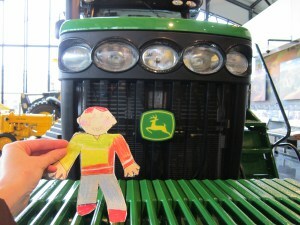 Then Flat Stanley and I went to Moline, Illinois, the world headquarters for John Deere. John Deere Combines, Seeders, and Construction Equipment like Dump Trucks and Skidders. Flat Stanley and I visited the John Deere Pavilion to see all kinds of machines, from very, very old tractors to the brand new ones. I think he liked the big ones best, because they are so HUGE!!! 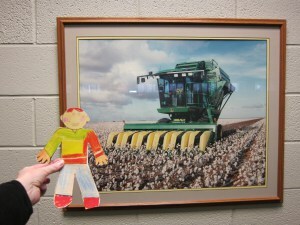 Flat Stanley and I had a lot of fun climbing on the equipment and learning about the things that farmers grow. I’m happy that Flat Stanley came to visit me! « No Need to Breathe Fire, Cool Off With Dragonfruit!